Friends! This is gonna be a good year for Black Bottle Riot. We kicked it off @ Eurosonic/Noorderslag in Groningen last week and it was a KILLER NITE. 100% Party. We’ll be comin’ your way sometime this year. Contact our booking agent (kevin@sozconcerts.nl) if you want to be totally sure of that. So… Got the debut record? Got the T-shirt? All designs of ’em? Well, at this moment we’re recording a couple of NEW TRACKS for a 10″ record. VINYL indeed. Totally fresh originals by yours truly, thus prepare to expand your BBR merch collection this Spring. And folks, if you like to read and your outta books: check this BBR interview at NU.NL. 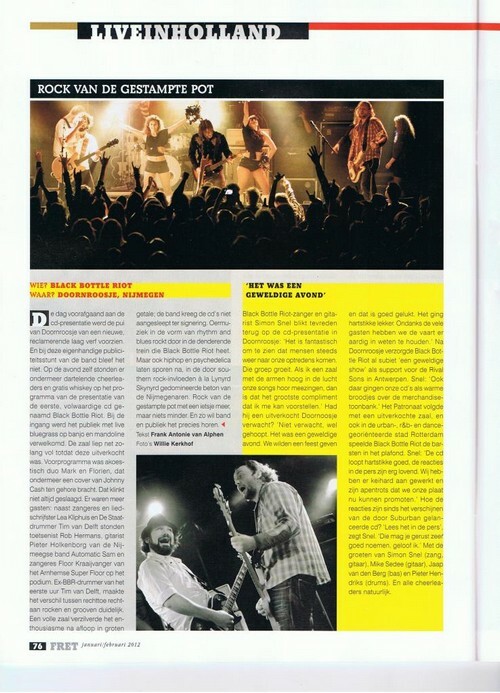 Or this review plus interview in FRET magazine. Cheers!